March means carpets – it is the month that we host the only trade event dedicated exclusively to real wool carpet and rugs. 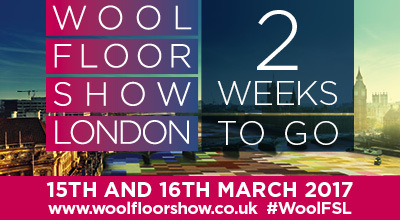 The Wool Floor Show in London offers a wide selection of wool carpets for the interior design industry to specific in residential, commercial and hospitality projects. Although that concept may seem unusual, there is a very good reason for doing this. The majority of the British and New Zealand wool clip goes into quality floor coverings. And so, for two days in March (15th and 16th) the Campaign for Wool brings the best names in the industry together in the centre of London (Stamford Bridge venue of Chelsea FC) to display the finest wool carpets the industry has to offer. In total we have over 23 exhibiting partners, the majority of those are wool carpet manufacturers and we have a few supporter brands too such as WoolSafe, which is the specialist wool cleaning organisation advocated by the industry. British Wool will also be exhibiting. This home grown fibre, which is grown on sheep across the country, is regarded by the industry for its strength and robust bulk, add warmth, softness, breathability, insulation, easy care and fire safety and you have truly incredible and reliable performance for floors. Wool carpets have been the standard for homes across the UK for many, many years. The wool carpet was a prized acquisition, it was seen as a status symbol, an investment worth making. Later when the industry introduced the more cost efficient tufted carpet manufacturing, the wider UK public finally had wool within their reach and they fell for the quality, durability and fabulous touch of beautiful wool for the floor. Heathered hues and plain neutrals in wool twist took over from the rich patterns and gone were the squares that reached to the side but not the corners! The wall-to-wall fully fitted wool carpet revolution was born. The UK became known as the home of 80/20 wool rich, the industry standard for hard-wearing, long-lasting tufted wool carpets. Homes carpeted with fitted wool were warmer, more insulated and so very smart. Today, the choice in wool is greater than ever, the neutral and natural colour bank leaves no shade unturned. There is also a colour and pattern revival, with statement floor pieces providing the entrance hall or living room with that individuality that design minded consumers want to see. Bold, bright, brave stripes provide show stoppers. Interesting patterns that are curated from archive collections but with a modern twist, combines something special with a story. Pride in the major pattern purchase continues to grow. Naturally coloured ranges that use no dyes and rely on the colour bank of the fleece, creates the environmental angle for those that adhere to interior style with ethical values embedded. Texture, the undeniable asset of wool, is teased out of the yarn in every conceivable format, from the beautiful berbers with their crunchy appeal to the near hand knitted looks that create the homespun home from the floor up. Woven axminster and wilton manufactured carpets, that use so much British Wool and which started the UK’s love of soft floors, continue to thrive. Today they are also setting the standard for quality, colour, iconic style and brilliant design for the floor, in cruise liners, casinos and luxury hotels across the world. At the Campaign for Wool, we are very proud of the important role our humble sheep play within that!